"There is an impressive absence in the text of the 'Our Father'. A word is lacking that in our times - but perhaps always - all hold in high esteem: the word 'I' is missing. " And "the whole second part of the 'Our Father' is declined to the first plural person: us". 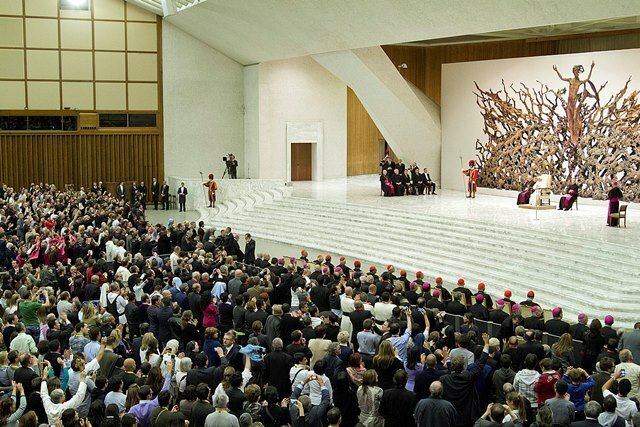 Vatican City (AsiaNews) - If it is not open "to the cry of many people near and far" my prayer "is no longer a Christian prayer", because "in prayer, a Christian brings all the difficulties of the people who live alongside him or her.” There “is no space for individualism in dialogue with God". Christian prayer as a prayer of a fraternal community is one of the fundamental aspects of the "Our Father" illustrated today by Pope Francis in the catechesis for the general audience. "Let us remember that before the Father we are always in communion with our brothers and sisters," he said in the greeting to the Germans. To the seven thousand people present in the Audience Hall including 11 seminarians from Hong Kong, Francis, resumed the cycle of catechesis on the 'Our Father'. He stressed, "Jesus does not want hypocrisy in prayer. True prayer is that which takes place in the secret of conscience, of the heart: inscrutable, visible only to God. It shuns falsehood: with God it is impossible to pretend ". "At its root is a silent dialogue, like an exchanged look between two people who love each other: man and God". "Yet, although the disciple's prayer is all confidential, it never expires in intimism. In the secret of conscience, the Christian does not leave the world outside the door of his room, but carries people and situations in his heart ". "There is an impressive absence in the text of the 'Our Father'. A word is lacking that in our time - but perhaps always - everyone holds in high esteem: the word 'I' is missing. Jesus teaches us to pray having the 'You' on our lips, because Christian prayer is dialogue: 'hallowed be your name, your kingdom come, your will be done'. And then it goes to 'us'. The whole second part of the 'Our Father' is declined to the first plural person: 'give us our daily bread, forgive us our debts, do not lead us to temptation, deliver us from evil'. Even the most basic human questions - such as having food to satisfy hunger - are all plural. In Christian prayer, no one asks for bread for himself: he prays for all the poor of the world ". "There is no room for individualism in dialogue with God. There is no ostentation of one's problems as if we were the only ones in the world to suffer. There is no high prayer to God that is not the prayer of a community of brothers and sisters. We: we are in community, we are brothers and sisters, we are a people that prays, we. Once the prison chaplain asked me a question: 'Tell me, father, what is the opposite of' I '?' And I, naive, I said: 'You'. 'That's the beginning of the war. The word opposite to 'I' is' us', where there is peace, all together'. It is a beautiful lesson I received from that priest ". "In prayer, a Christian brings all the difficulties of the people who live near him: when he comes down in the evening, he tells God about the pains he has encountered on that day; he puts before him many faces, friends and even hostiles; he does not drive them away as dangerous distractions. If one does not realize that there are many people around him who are suffering, if he does not pity for the tears of the poor, if he is addicted to everything, then it means that his heart is of stone. In this case it is good to beg the Lord to touch us with his Spirit and to soften our heart. Christ did not pass unharmed by the miseries of the world: whenever he perceived a loneliness, a pain of the body or the spirit, he felt a strong sense of compassion, like a mother's womb. This 'feeling compassion' is one of the key verbs of the Gospel: it is what drives the good Samaritan to approach the wounded man on the side of the road, unlike others who have a hard heart ". "We can ask ourselves: when I pray, I open myself to the cry of many people near and far? Or do I think of prayer as a kind of anesthesia, in order to be calmer? In this case I would be the victim of a terrible misunderstanding. Of course, mine would no longer be a Christian prayer. Because that 'we', which Jesus taught us, prevents me from being alone, and makes me feel responsible for my brothers and sisters". "Saints and sinners - he said - we are all brothers loved by the same Father. And, in the evening of life, we will be judged on love. Not just sentimental love, but compassionate and concrete, according to the Gospel rule: "Whatever you have done to one of these least of my brothers, you have done it to me" (Mt 25,40). Thus says the Lord ". 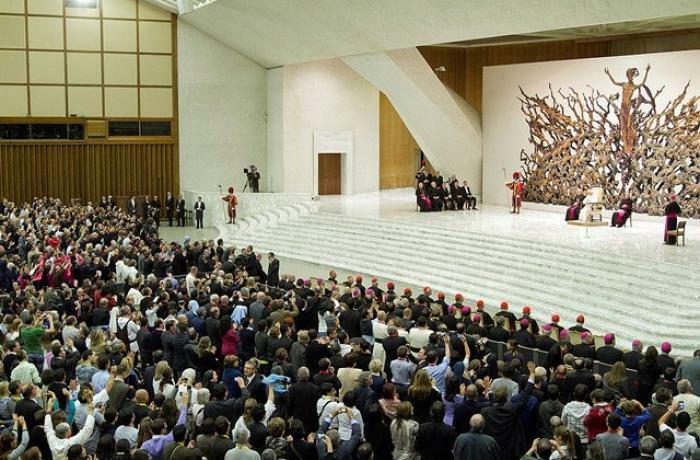 Pope: to love the poor, "not with words, but with deeds"